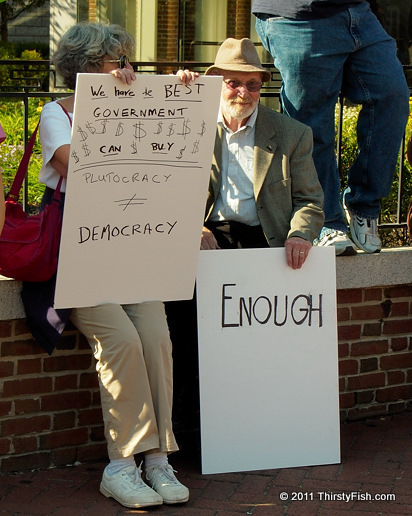 Plutocracy is not Democracy! Enough! "Plutocracy is the rule by the wealthy, power provided by wealth". I would argue that our current system more resembles a plutarchy; a combination of plutocracy and oligarchy. When it comes to corporations, there is no difference between Republicans or Democrats. Criticizing Republicans as a democrat, or Democrats as a republican, is an exercise in futility. The real culprits are those corporations that have hijacked this government and governments around the world. Corporations, wake up! If you don't have anyone left to buy your goods and services, you can not make a profit. If the majority is in perpetual debt, earning low wages, not being able to afford a home, health insurance, college or everyday goods, then you no longer have a stable market. What you have is an angry majority. You can postpone it for so long using the media pundits and politicians that you have paid for. And those that blame the victims are out of touch; they do not understand that opportunity is rapidly vanishing in The Land of Opportunity. Both the Tea Party and Occupy Wall Street movements recognize the dire situation on main street. Where the Tea Party protestors primarily hold the government responsible for this decline, Occupy Wall Street protestors emphasize the influence of corporations on the government. I do not know whether Occupy will have enough steam to bring forth change. But, what I do think is that plutarchy, as it currently stands, can not be sustained for too long in the United States. First they ignore you, then they ridicule you, then they fight you, then you win!